The War Operation Plan Response (WOPR) computer is out of control! Only you have access to its A.I. Beat him in Tic Tac Toe to rescue the world! 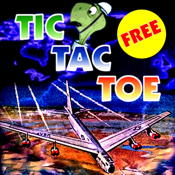 An epic Tic Tac Toe like you have never played before!